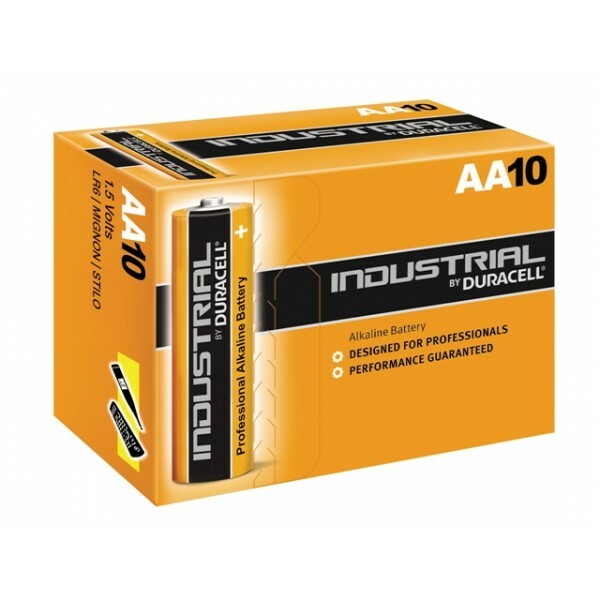 ID1500 Batteria stilo da 1,5 Volt INDUSTRIAL by DURACELL, tipo "AA", alcalina MnO2, formato IEC LR6. Sostituisce l'analoga batteria 1,5 Volt marcata Procell-Duracell. Vendita in confezioni di 10 batterie stilo "AA". The story of DURACELL begins in the early 1920's with an inventive scientist named Samuel Ruben and an eager manufacturer of tungsten filament wire named Philip Rogers Mallory. Ruben came to the P.R. Mallory Company seeking a piece of equipment he needed for an experiment. But Ruben and Mallory saw an opportunity: uniting the one's inventive genius with the other's manufacturing muscle. Their partnership, which would last until 1975 with Mallory's death, was the bedrock of DURACELL International. Samuel Ruben's inventions revolutionized battery technology. Amidst World War II, for instance, Ruben devised the mercury cell, which packed more capacity in less space and was durable enough for the harsh climates of wartime theaters like North Africa and the South Pacific places where ordinary zinc carbon batteries used in flashlights, mine detectors, and walkie-talkies couldn't hold up. P.R. Mallory manufactured millions of mercury cells for the war effort. The Mallory Battery Company was formed shortly thereafter. In the 1950's, Samuel Ruben went on to improve the alkaline manganese battery, making it more compact, durable, and longer lasting than anything before it. At about the same time, Eastman Kodak introduced cameras with a built-in flash unit that required more power than zinc carbon cells could provide. The cameras needed alkaline manganese cells but in a new size, the AAA. Mallory made them, and also licensed the technology to others because the company, at that time, had no consumer distribution. The photographic demand for power put alkaline cells on the map and the DURACELL brand was introduced in 1964. Soon, the consumer market for DURACELL batteries rocketed and supplies had to be rationed in the 1970's as manufacturing capacity caught up. Today, DURACELL is the world's leading producer of high-performance alkaline batteries. The tradition of innovation started by Ruben and Mallory is still evident in new DURACELL batteries such as DURACELL ULTRA with M3 Technology. DURACELL believes there is no limit to the potential of portable power and as a company we will always strive to find innovative and efficient ways to power your life in the future.